After the establishment of the Golden Age Gorinchem Foundation, on 26 November 2008 the Friends for the Golden Age Gorinchem Foundation has been founded as well. The goal of the Friends is that individuals, by becoming a member for fifty Euros a year, can support the work of the Foundation. With the help of the membership-fee, paintings and drawings can be acquired. The Van Andel-Spruijt Foundation, based in Gorinchem, has promised to support the Golden Age Gorinchem Foundation financially for the coming three years, contributing to ongoing costs such as website maintenance, communication, visits to auctions and fairs and expenses for the advice of external experts. The large picture of seven by seven meters with the text ‘The Golden Age returns to Gorinchem’, that was installed in September, has been taken down from the front of the Gorcums Museum in December. 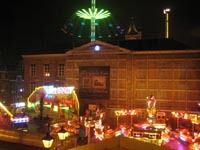 The image has drawn the attention of many visitors to the Grote Markt (Grand Market) and has thus given publicity to our goal. 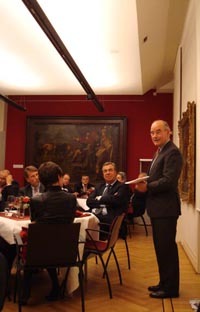 On 24 October, a dinner took place in the auditorium of the Gorcums Museum for the occasion of the start of the Golden Age Gorinchem Foundation. The complete executive council including the mayor of Gorinchem was present, as well as enthusiast from Gorinchem and well-known art historians, such as Professor Dr. Eric Jan Sluijter of the University of Amsterdam and Professor Dr. Volker Manuth of the Radboud University Nijmegen, Dr. Peter Sigmond, Dr. Nicolette Sluijter-Seijffert, Dr. Marieke de Winkel and Dr. Petria Nobel. During the dinner, promises were made for the acquisition of one painting and the restoration of a painting by the artist Gerard van Kuijl from Gorcum. This last painting hangs in the auditorium of the Gorcums Museums. The restoration of this painting is expected to start in the first quarter of 2009. 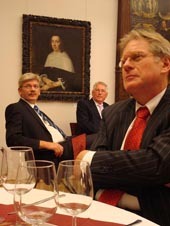 On 7 November, two members of the Golden Age Team attended a dinner at Sotheby’s in Amsterdam, where contacts were made with experts of Sotheby’s Old Masters Team and several art dealers. In the fourth quarter, regular contact has been made with the external expert on Old Masters, about possible acquisitions at auctions in the Netherlands and London. This has not yet resulted in actual purchases. Because of the interferences of the Golden Age Team, the Gorcums Museum has also been offered a small number of paintings, but the quality of these works did not meet museum standards. The chair of our board, Drs. Bert Biemans MA, has given several lectures in Gorinchem but also in the Alblasserwaard region, such as Hoornaar and Oud-Alblas. Furthermore, on 19 December, he took part in a small international symposium of the University of Amsterdam about the amount of paintings that was produced in the Dutch Republic in the 17th century. While up till now the number of between seven and eight million produced paintings is commonly used, Biemans believes the number lies closer to one million. A new discussion has commenced in the academic world due to his calculations. In the corridors of abovementioned meeting, Dr. Peter Carpreau, curator of the Museum of Leuven, told us that a relic canvas of the Marters of Gorcum is present in Leuven. 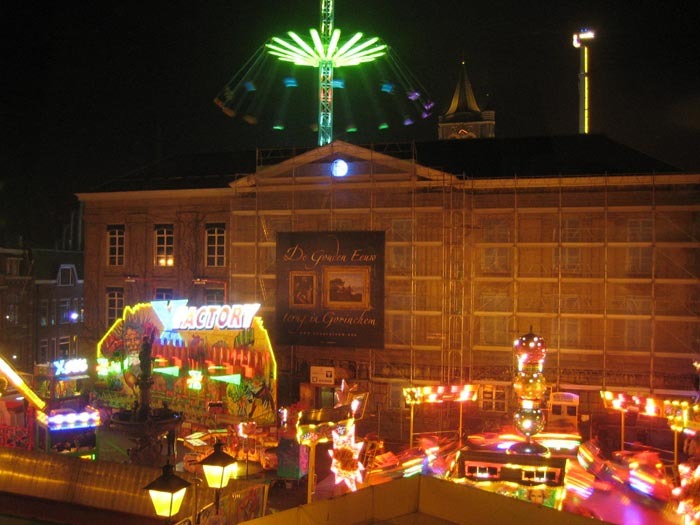 The Golden Age Team hopes to visit Leuven in the beginning of 2009. On 5 January 2009, an intern of the Master Programme in Art History of the University of Amsterdam, Sarah Broekhoven, shall in the course of two months make a record of paintings of Gorcum’s Old Masters that stay in the depot of museums in the Netherlands, Belgium and Germany. In so doing we will get an overview of the paintings that are not exhibited in the public areas.